The Aga Exchange has been successfully operating for over 26 years supplying reconditioned Aga cookers/ranges that are of top quality vitreous re-enamelled in your choice of color. Whether you choose Electricity, Gas or Oil, your Aga Cooker will have a new burner and carry a two year parts and labour warranty. 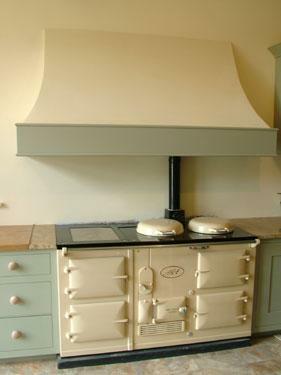 We can also take your existing Aga Cooker in part exchange. We have installed over 1000 reconditioned Aga cookers all over central and southern England, and as far as Belgium, Holland and France. We can deliver an Aga Cooker complete on a pallet ready to install anywhere in mainland U.K. with your choice of installer. Our prices include free delivery and installation within 50 miles. We will quote for extra mileage. We are conveniently located in Bere Regis where the A35 and A31 meet. Why not come and have a look at our showroom and see what we have to offer. We always have a large range of Aga Cookers ready for immediate installation, either re-enamelled or used in almost perfect condition. In all cases with used Aga Cookers we fit new top plates and lids. We offer a same day exchange service on your Aga Cooker, or on re-enamelled parts for the whole or parts of your Aga Cooker e.g. top plates, lids etc. We also stock replacement gas burners for all Aga Cooker models. Yes, we keep a stock of all parts for Aga Cookers! Over 20 Aga cookers in stock 2 oven and 4 oven ready to be enamelled in choice of colour. Ring for prices which include rebuilding on site and 2 years' guarantee. New Electric conversion kit now available - call for information or come in for a demonstration.